Mastronarde makes the point that αὐτὸς was in its origin reflexive and that the reflexive pronouns are formed by adding it to the personal pronouns, even the singular ones. Isn't Greek wonderful. Get bothered by something. Tell others. Get them bugged by something related? OK, the ship has set sail on its several year journey. A year of preliminaries are over and I have just started the book in earnest. No stopping till the end of book VIII. I am hoping that it takes less time than the war itself! τὰ γὰρ πρὸ αὐτῶν καὶ τὰ ἔτι παλαίτερα σαφῶς μὲν εὑρεῖν διὰ χρόνου πλῆθος ἀδύνατα ἦν, ἐκ δὲ τεκμηρίων ὧν ἐπὶ μακρότατον σκοποῦντί μοι πιστεῦσαι ξυμβαίνει οὐ μεγάλα νομίζω γενέσθαι οὔτε κατὰ τοὺς πολέμους οὔτε ἐς τὰ ἄλλα. What is the subject of the first part of this? Is it the noun phrase τὰ γὰρ πρὸ αὐτῶν καὶ τὰ ἔτι παλαίτερα σαφῶς? Or is it the infinitive εὑρεῖν? The fact that ἦν can work with either the neuter noun phrase as subject or the infinitive as subject is probably the main thing that makes this so slippery. Hobbes opts for the noun phrase: "For though the events of remote antiquity, and even those that more immediately precede the war, could not from lapse of time be clearly ascertained..." Cameron seems to agree with this as he claims the infinitive is epexegetical on the adjective. This brings us to another thing that makes it slippery: the epexegetical infinitive is usually active. Morris and Marchant opt for the infinitive. If we were to rework Hobbes' translation for this reading, we would get: "For though to ascertain the events of remote antiquity, and even those that more immediately precede the war was not possible..."
15. ἀδύνατα—Thuc. frequently uses the neut. plur. of the verbal or of an adj. for the sing. where the subject is an infin. or a sentence. The use is mainly poetical. 1) Hobbes and Cameron are right. 2) Morris and Marchant are right. 3) All four are wrong (except perhaps Hobbes because as a translator he had to make a choice) and they are all wrong because the Greek is indeterminate and both readings are perfectly good. Of the Morris references, some don't have objects, and so the infinitive has to be the subject. A few have objects that are relative noun phrases beginning with ἃ where I guess assimilation has occurred and a demonstrative pronoun has dropped out (see II.72 and II.74), but I am not sure (ie I forget and am too lazy to look it up at the moment) if these can be subjects. One has no copula (see II.97). And at IV.1, it seems that there is already a clear subject. So I am not sure what Morris thinks his references prove. In a lot of the cases, it seems that the infinitive is the subject. But in plenty of other cases, it seems that it is not. So how can Morris and Marchant, be so sure that the subject here is the infinitive? Hornblower gives a gloss that seems to agree with Hobbes and Cameron. I say seems to because his three volume commentary is more concerned with historical than linguistics issues. And I'm sorry John, he doesn't take up the ama issue from book VI. The Belgian site seems to be working now. I just checked and there are about 300 occurrences in Thucydides. Maybe you, Nate and I could do 100 each and see what we learn? Too late to join in? I have a bit of spare time! I'd love to re-read Thucydides! pster wrote: OK, the ship has set sail on its several year journey. A year of preliminaries are over and I have just started the book in earnest. No stopping till the end of book VIII. I am hoping that it takes less time than the war itself! Think in any case how little difference in meaning the two possibilities you've provided have. Scribo wrote: Too late to join in? I have a bit of spare time! I'd love to re-read Thucydides! Not at all! Awesome. John has read it before. I memorized all the vocabulary from Book I and have just started on my multi-year voyage through all eight books and so far it is going pretty smooth. Please, by all means, start posting questions. I have committed to respond within 48 hours to any post and John seems up to talk about almost anything. Nate as usual can't keep away. I'll be fascinated to see what kind of pace you set. I think I could go much faster than the first time I started it (12 months ago) if I didn't stop to obsess about the copula! If you can gear the conversation to more historical matters that would be great. I just picked up Thucydidean Themes and The Greek World, both by Hornblower. Sure, but "it is/was" won't work for all of passages Morris refers to. And more significantly, only Hobbes is translating and all three of the other guys have definite views, leaving me wondering what are they seeing that I'm not. However that may be, it seems like you are opting for 3, all are wrong. I'll mark down your vote. I understand that it is not the most pressing question facing us, but if I can't stop to ponder the copula on the first page, when can I? pster wrote: Hornblower gives a gloss that seems to agree with Hobbes and Cameron. I say seems to because his three volume commentary is more concerned with historical than linguistics issues. pster - many thanks for this, and for checking Hornblower for me. 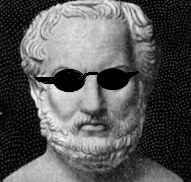 I'm afraid that, due to ill health, I've had to put my own Thucydides reading on hold for a little while, and for the same reason I may not be as helpful on queries as I'd like to be. With regard to 1.1.3, most commentators who discuss it seem to take ἀδύνατα as simply being used here for the singular - one of the best 19th-century editors, Krueger, takes it in this way. That would tally with your Marchant/Morris position. Against that, the preceding τὰ γὰρ πρὸ αὐτῶν καὶ τὰ ἔτι παλαίτερα seem at first sight to agree naturally with ἀδύνατα. This may ultimately prove to be yet another Thucydidean instance of 'you pays your money and you takes your choice', but if, when I'm feeling up to it, I have any further thoughts, I'll get back to you. Good luck to you and Scribo as you set sail on the good ship Thucydides - I hope to rejoin you soon! I'm very sorry to hear about your health. Make sure to find good real experts to handle your issues. Your presence will be missed and your seat at the head of the table will remain empty till you return. pster - many thanks for your very kind remarks. I'm feeling a bit better at the moment, so I thought I'd look in, even if I can't always do so as often as I'd wish. While hors de combat, I've given a little further thought to your query regarding τὰ γὰρ πρὸ αὐτῶν καὶ τὰ ἔτι παλαίτερα σαφῶς μὲν εὑρεῖν διὰ χρόνου πλῆθος ἀδύνατα ἦν (1.1.3). Doesn't the problem effectively amount to whether ἀδύνατα here is personal or impersonal? Betant's Lexicon Thucydideum (which I recommend) gives numerous examples of Thucydides' use of ἀδύνατον/ἀδύνατα in the sense of (as Betant renders it) 'quod fieri nequit', but he classifies all but two of these as impersonal. The two personal examples are at 4.21.1 (ὁρῶντες τῶν τε ἐπιτηδείων τὴν περὶ τὴν Πελοπόννησον κομιδὴν ἀδύνατον ἐσομένην) and 6.39.2 (ἃ ὑμῶν οἵ τε δυνάμενοι καὶ οἱ νέοι προθυμοῦνται, ἀδύνατα ἐν μεγάλῃ πόλει κατασχεῖν): the second of these two is interesting, in that the opening ἃ agrees (in Betant's view) with ἀδύνατα following. Both Marchant and Smith (in the Ginn series) share this view. In spite of his treatment of 6.39.2, Betant classifies ἀδύνατα at 1.1.3 as impersonal, and most commentators seem to agree. In view of 6.39.2, however, I'm less sure: why can't ἀδύνατα there agree with the preceding τὰ ... τὰ, just as it agrees with ἃ at 6.39.2? On what grounds should one treat the two differently? It thus looks as if we need to resolve this issue to help us with two passages, rather than just one! Any thoughts? I'm looking into it today. This is my first look at Betant. I don't quite understand his layout. He gives a singular and a plural, then a long list of impersonals, then a long list of plurals. But aren't some impersonals plural? I have to read up on impersonal verbs for my other thread. I'll post more in a couple of hours. So I have Hornblower's commentaries (still haven't asked him to sign it, I am a coward...), another book on verb forms in Thuc, lots of articles, a book on prose styles....and so I'm ready to start in my break. The two personal examples are at 4.21.1 (ὁρῶντες τῶν τε ἐπιτηδείων τὴν περὶ τὴν Πελοπόννησον κομιδὴν ἀδύνατον ἐσομένην) and 6.39.2 (ἃ ὑμῶν οἵ τε δυνάμενοι καὶ οἱ νέοι προθυμοῦνται, ἀδύνατα ἐν μεγάλῃ πόλει κατασχεῖν): the second of these two is interesting, in that the opening ἃ agrees (in Betant's view) with ἀδύνατα following. Both Marchant and Smith (in the Ginn series) share this view. As I said above, I don't understand Betant's entry. This seems to be what we have to work with. I dont really understand what kind of participle that is. It doesn't seem conditional, concessive, temporal or causal. And don't we need a finite verb anyway? Don't we?? Why don't Smith and Marchant think the copula is finite? Can't we use the relative as the subject like that? Thucydides phrasing is explained by the way the phrases build on what came before, which required that the relative phrase to be out front. OK, gotta break for grub. Scribo wrote: So I have Hornblower's commentaries (still haven't asked him to sign it, I am a coward...), another book on verb forms in Thuc, lots of articles, a book on prose styles....and so I'm ready to start in my break. You can read it online you know. Bigger fonts will save your eyes. pster wrote: As I said above, I don't understand Betant's entry. pster - sorry for the late reply. I agree with you that, in 6.39.2, the omitted copula seems more likely to be finite - presumably ἐστιν to go with the neuter plural. 1.1.3: τὰ ... εὑρεῖν ... ἀδύνατα ἦν = 'the [events] were impossible to discover'. For the use of an active verb after an adjective where one might logically expect a passive verb, Smith (on 6.39.2) refers us to section 763 of Goodwin's Moods and Tenses (incidentally, I never seem to see this work mentioned on here: am I the only who who still consults it?). Unfortunately Goodwin does not cite any Thucydidean examples, but he does give one from Plato's Phaedo (90c-d), λόγου ... δυνατοῦ κατανοῆσαι, 'a speech possible to understand', which seems a useful parallel. pster wrote: This is my first look at Betant. I don't quite understand his layout. He gives a singular and a plural, then a long list of impersonals, then a long list of plurals. But aren't some impersonals plural? I have to read up on impersonal verbs for my other thread. I'll post more in a couple of hours. John, can you clear this up for me. Can't we have quasi-impersonals that are plural? Indeed, aren't most? LSJ II seems to imply as much as for things c. inf. they give one singular example and many plural examples. And there is something strange about Betant's layout. It seems those first two entries are just representative, one singular and one plural. He classifies it as "Plur." which he mysteriously seems to treat as distinct from "Impersonaliter". Maybe his em-dash means less than LSJ's? Somehow I think we are both misreading him. Re Betant, I agree his layout is not as clear as it might be. I think what he is doing is splitting the uses of ἀδύνατος into two main categories, the first of which broadly means 'powerless' ('potestatem nullam habens, imbecilis'). Within this first category, after a dash, he identifies a sub-category in which ἀδύνατος + infinitive = 'unable to do something' ('invalidus ad rem aliquam gerendam, qui non potest'). - impersonal ('impersonaliter'), in which he again lists first the singular and then the plural examples. I interpret him as regarding just the two examples he cites as personal, and all the others he lists as impersonal. But of course one doesn't have to agree with him on this! I hope this helps. Betant may take some getting used to, but he is very helpful in finding other Thucydidean instances of a word to inform one's own decision as to its meaning in a particular place. Right, I should have used the singular. One thing I don't like about this is that the subject would have to be the ἃ phrase. But I don't think that is allowed. On my reading, we can take the ἃ phrase as a predicate where a demonstrative has dropped out--at least I think that is what I would have to say. On your reading we would have to have the demonstrative drop out of the subject which is probably not really allowed. Or perhaps you are thinking to take the entire first part beginning with ὀλιγαρχία as the subject for your ἐστιν? That's bold. Actually, I kind of like it now that I look at it. No disappearing demonstrative needed! Of course, I could probably try and smuggle in the whole first part as my object. John W. wrote: 1.1.3: τὰ ... εὑρεῖν ... ἀδύνατα ἦν = 'the [events] were impossible to discover'. Here, the infinitve is so far out in front of the adjective, that I am uncomfortable. Although this usage is supposed to give us some sense of the infinitive being originally a dative and we do put datives out in front. So maybe not so bad. John W. wrote: For the use of an active verb after an adjective where one might logically expect a passive verb, Smith (on 6.39.2) refers us to section 763 of Goodwin's Moods and Tenses (incidentally, I never seem to see this work mentioned on here: am I the only who who still consults it?). Unfortunately Goodwin does not cite any Thucydidean examples, but he does give one from Plato's Phaedo (90c-d), λόγου ... δυνατοῦ κατανοῆσαι, 'a speech possible to understand', which seems a useful parallel. I mentioned this as one of my two slippery features at the outset. "still consults it?" --Today was my first time ever consulting Goodwin. I think to times when I am uttering long sentences. It seems that there are plenty of times when I am on a roll, especially when I start leaving out copulas and what not or when I start linking sentences in subtle ways, that there are likely more than one way to diagram the sentences. However, I think that in these adunata examples because the plural gets used so often quasi-impersonally with the infinitive and because that is such a flexible formulation, that there is a certain semantic pull to it that almost no syntax can really control. And so even if a speaker sets out to employ a personal usage, the quasi-impersonal one comes along as a kind of freebe. I've since found this same example from Plato cited by Smyth (section 2006). pster - many thanks for your comprehensive analysis; your conclusions as to the 'impersonality' of ἀδύνατα in these passages may, after all, be correct. One key question for me, which we've not specifically addressed, is this: if Thucydides wished to use the word in its impersonal sense, would he have opted for the neuter form ἀδύνατα in such close, and potentially misleading, proximity to the neuter plurals ἃ and τὰ in these two passages, or would he have used the singular ἀδύνατον to obviate any risk of confusion? That said, of course, I certainly accept that this is by no means an overwhelming argument, given that Thucydides can scarcely be said to go out of his way to avoid potential confusion of one sort or another in many different places! One other example in Betant's list has struck me as interesting in this context: 2.72.2, i.e. ἀπεκρίναντο αὐτῷ ὅτι ἀδύνατα σφίσιν εἴη ποιεῖν ἃ προκαλεῖται ἄνευ Ἀθηναίων. Despite the proximate presence of ἃ, the use of ἀδύνατα here looks impersonal (Betant certainly classifies it as such), which I think may reinforce your argument as to the other two passages we have discussed. I'll have more in 24 hours. I need to go back to bed now. John W. wrote: One other example in Betant's list has struck me as interesting in this context: 2.72.2, i.e. ἀπεκρίναντο αὐτῷ ὅτι ἀδύνατα σφίσιν εἴη ποιεῖν ἃ προκαλεῖται ἄνευ Ἀθηναίων. Despite the proximate presence of ἃ, the use of ἀδύνατα here looks impersonal (Betant certainly classifies it as such), which I think may reinforce your argument as to the other two passages we have discussed. The presence of σφίσιν makes that one somewhat easier. The dative of agent is only used by perfect passives and verbal adjectives. According to Chantraine, dunatos is a verbal adjective. And the privative adunatos/a presumably gets treated as such. I can find no discussion of the agent for the so-called "epexegetical infinitive" but if such a thing even exists, I assume it would have to be in the accusative. In that 2.72 example, are supposed to just assume that the antecedent has dropped out? Ie that ταῦτα ἃ has been reduced to just ἃ? If so, then it is striking Smyth doesn't give this neuter plural case any special attention around section 2509. One would think that it would be the most common of all dropped antecedents. One key question for me, which we've not specifically addressed, is this: if Thucydides wished to use the word in its impersonal sense, would he have opted for the neuter form ἀδύνατα in such close, and potentially misleading, proximity to the neuter plurals ἃ and τὰ in these two passages, or would he have used the singular ἀδύνατον to obviate any risk of confusion? Great question. I know that it has nothing to do with hiatus. Overall, I am most impressed with how LSJ only has one entry for the singular quasi-impersonal, but many entries for the plural. So now, since you raised this question, I am working through the list of examples that Bebant gives under "Impersonaliter". I got to do my Polybius to get away from it for a while, and there it is as substantive! Another point, I'm afraid, on which your views would be welcome. Early in Book 5, the Athenians and Lacedaemonians make a peace treaty (quoted in chapters 18-19). In chapter 17 Thucydides has already made it clear that 'what was being negotiated was not satisfactory' to some of the Lacedaemonians' allies, who refused to sign up to it at that time. οἱ δὲ ξύμμαχοι ἐν τῇ Λακεδαίμονι αὖθις ἔτυχον ὄντες, καὶ αὐτῶν τοὺς μὴ δεξαμένους τὰς σπονδὰς ἐκέλευον οἱ Λακεδαιμόνιοι ποιεῖσθαι. οἱ δὲ τῇ αὐτῇ προφάσει ᾗπερ καὶ τὸ πρῶτον ἀπεώσαντο οὐκ ἔφασαν δέξεσθαι, ἢν μή τινας δικαιοτέρας τούτων ποιῶνται. (i) Most translators, from Hobbes onwards, appear to take it as passive, in which case one could translate: '... unless a fairer treaty than this was made'. However, I'm a little uneasy about this, especially so soon after the middle use of ποιεῖσθαι. (ii) It would yield good sense if the Lacedaemonians were the understood subject, in which case the meaning would be: '... unless the Lacedaemonians made a fairer treaty than this [i.e. with the Athenians]'. However, could the subject switch to the Lacedaemonians without a pronoun to signal this? (iii) The third option would be for the subject to remain the allies, and for ποιῶνται to mean 'ratify' or 'sign up to' (as ποιεῖσθαι does). In that case the meaning might be: '... unless they [= the allies] could sign up to a fairer treaty than this'. (iv) Finally, ποιῶνται could I suppose apply generally to all parties, actual and prospective, to the treaty - the Athenians, Lacedaemonians and their allies. In that event one could render: '... unless all the parties involved made a fairer treaty than this'. Your thoughts would be much appreciated since, as far as I can see, none of the commentaries offers any help on this point! Sorry, but I have a stupid question. How can it be passive given that τινας is accusative? Superficially I would take both of them as Med. with the sense of "adopt" or "make ones own". So in the first instance the Spartans are urging them to adopt τὰς σπονδὰς. In the second instance the allies are refusing unless they (allies plus Spartans) adopt τινας (σπονδὰς) more conformable to custom. I'm sure I have overlooked something really obvious. But what is wrong with this interpretation? Hornblower has a full page discussion of the first 20 words. Evidently there is some question whether the allies remained or went home and came back. He seems to come down on the side of going home and coming back. Let me know if you want me to read what he says closely. I just skimmed it. pster wrote: Hornblower has a full page discussion of the first 20 words. Evidently there is some question whether the allies remained or went home and came back. He seems to come down on the side of going home and coming back. Let me know if you want me to read what he says closely. I just skimmed it. pster - many thanks for this and your previous posting. I should have mentioned the accusative point, which is of course another argument against the verb's being passive (despite the fondness of translators for rendering it as such). I'd be grateful if you could see if Hornblower sheds any light. For my current reading of Thucydides I'm using Alberti's edition of the Greek text, which reads αὖθις instead of the OCT's αὐτοὶ before ἔτυχον ὄντες, and so supports what you say is Hornblower's interpretation. I'd say there's nothing at all wrong with your interpretation, which effectively combines my second and third options - it's just that the translators and commentators offer next to no help on this point, and I wanted to sound you out before reaching a decision. By the first twenty words, I meant οἱ δὲ ξύμμαχοι...ποιεῖσθαι. Hornblower's discussion of this is a super dense page because this is a much emended passage. I will look at it again tomorrow. I may just have to type it and send it to you in a PM. pster wrote: By the first twenty words, I meant οἱ δὲ ξύμμαχοι...ποιεῖσθαι. Hornblower's discussion of this is a super dense page because this is a much emended passage. I will look at it again tomorrow. I may just have to type it and send it to you in a PM. pster - I'm most grateful, but reluctant to put you to that much trouble. Please only do so if you really have the time. Could I request a little help with Thucydides 5.38.3? οἱ δ᾽ ἐν ταῖς βουλαῖς τῶν Βοιωτῶν ὄντες οὐ προσδέχονται τὸν λόγον, δεδιότες μὴ ἐναντία Λακεδαιμονίοις ποιήσωσι, τοῖς ἐκείνων ἀφεστῶσι Κορινθίοις ξυνομνύντες: οὐ γὰρ εἶπον αὐτοῖς οἱ βοιωτάρχαι τὰ ἐκ τῆς Λακεδαίμονος, ὅτι τῶν τε ἐφόρων Κλεόβουλος καὶ Ξενάρης καὶ οἱ φίλοι παραινοῦσιν Ἀργείων πρῶτον καὶ Κορινθίων γενομένους ξυμμάχους ὕστερον μετ᾽ αὐτῶν Λακεδαιμονίων γίγνεσθαι, οἰόμενοι τὴν βουλήν, κἂν μὴ εἴπωσιν, οὐκ ἄλλα ψηφιεῖσθαι ἢ ἃ σφίσι προδιαγνόντες παραινοῦσιν. In this scenario one would have to take σφίσι as a dative of interest. The latter is common enough in Thucydides, though I can't at present bring to mind an exact parallel to its use here. Does anyone have a view as to which of these options is correct? Any thoughts would be much appreciated. John, while I'm making my coffee, let me just ask a simple question. Doesn't σφίσι always refer to the subject of the main clause? Isn't that why we call it an indirect pronoun? pster wrote: John, while I'm making my coffee, let me just ask a simple question. Doesn't σφίσι always refer to the subject of the main clause? Isn't that why we call it an indirect pronoun? I've always had trouble figuring out this pronoun. Still do. Harold North Fowler noted this and concluded it refers to the subject of ψηφιεῖσθαι (the Council). that is, as referring to the Boeotarchs, is "just as possible". pster, Nate - many thanks, and apologies for the late reply. Nate has kindly saved me the trouble of looking up the reference in Smyth. As this suggests, Thucydides' use of σφίσι is somewhat flexible, and this sometimes gives rise to problems such as this. The three great commentaries by German scholars - those of Krueger, Poppo-Stahl and Classen-Steup - all come down in favour of σφίσι referring to the Boeotian councils, though Krueger does at least mention the view of a scholar named Arndt (in a work on reflexive pronouns) that it refers to the boeotarchs. Goeller's commentary (1835) takes the view that σφίσι refers to the boeotarchs, but confuses things further by taking παραινοῦσιν not as referring to the boeotarchs' advice to the councils, but as the advice from the Lacedaemonian ephors Cleobulus and Xenares (see earlier in the passage I quoted) to the boeotarchs! I really can't see how this would work, given that in my view προδιαγνόντες must refer to the boeotarchs. Hey ho! I'm quite attracted to the σφίσι = boeotarchs school, but I have to decide whether to go with this, or yield to the preponderance of scholarship on the other side.